The family-friendly Festival of Light will be held at 5 p.m. This service is created with family in mind. Candlelight, Communion, and Celebration of Lights, all in 55 minutes or less! Worship is geared to the young and young at heart, as well as appropriate for people aged one to a hundred and one! The sermon is prepared to engage with everyone. To enhance our worship, bring your flashlights, glow sticks, smartphones, spotlights, and more. If it lights up, we'd love to see it! A service filled with song, hope, and the message of the Light of the World: Jesus Christ. St. John's Festival of the Nativity will be held at 7 p.m. This is a traditional candlelight and communion service as celebrated for many years at St John’s. The Christmas scriptures, hymns, and a setting both familiar and festive: this is a time we gather and give thanks for the birth of Immanuel, God with us! The final Christmas eve celebration of the night will be A Festival of Lessons and Carols at 9 p.m. This service is both contemplative and celebratory. Seven readings of Christmas prophecy and scripture are interspersed with carols and special music. No sermon is preached. Candlelight and Communion are given with a sense of the wonder of the Word made flesh, as we celebrate the coming of the Christ child. No Christmas Day services will be held at St. John's, but join us for the 3rd and 4th Days of Christmas on Saturday, December 27, or Sunday, December 28, during our regular worship services as the 12 Days of Christmas continue to reveal the Light of Christ. Did you miss John The Baptist? 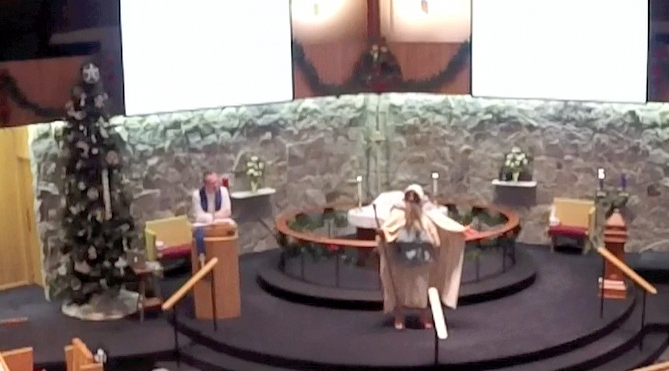 If you missed John the Baptist at St. John's on December 7, you can see the video replay of the 8:30 a.m. version on our facebook page. Check it out here! St. John’s Sunday School held their 2014 Children's Christmas Program “Shepherds, Sheep and a Savior" on Saturday, December 6, 2014, at 5 pm, under the direction of Jolene Ziebell, St. John's Coordinator of Youth Ministries. This 30-minute musical presented one of the most familiar parts of the Christmas story. God chose lowly, humble shepherds to be the first ones to see the Savior! If you missed it, you can view photos & video of the program on our facebook page. Click here to view the Facebook photo album. Click here to view the video on Facebook. On Saturday, December 6, at 5 p.m., the St. John’s Sunday School will present the 2014 Children's Christmas Program. Entitled “Shepherds, Sheep and a Savior," this 30-minute musical will present one of the most familiar parts of the Christmas story. God chose lowly, humble shepherds to be the first ones to see the Savior! Plan to attend the St. John's Sunday School Christmas Program at 5 p.m., as it will be in lieu of the regular Saturday evening 6 p.m. worship service. That's right. No preaching or communion Saturday night. We'll see you LIVE at FIVE on December 6th. On Sunday, December 7, it's Celebration Sunday at St. John's. During our 8:30 and 11 a.m. worship services, we will gather to present our pledges and time & talent sheets for the upcoming year while the faith of John the Baptist comes alive in our midst. At Noon, a catered meal will be served at no charge in the fellowship hall to thank you for your offerings of time and talents, resources and relationships through St. John's. The information we receive on this day will assist us in the structuring of the 2015 Vision for Mission which will be submitted to the congregation at the January 2015 annual meeting. On the weekend of December 13 & 14, baptized children of God at St. John's who will have attended December confirmation classes will receive First Communion at any one of the three worship services. We look forward to celebrating First Communion with the families of those baptized young people who will be taking part in the Lord's Supper for the first time. On the weekend of December 20 & 21, St. John's Majesty Choir presents Canticles in Candelight: A Cantata for Christmas by Joseph M. Martin. Canticles in Candlelight is a musical service of illumination that gradually fill the sanctuary with music and light. With Scripture, narration, carols, and candles, this compelling cantata tells the treasured story of Christ's birth. From the hushed whisper of the "Processional" to the festive arrangements of beloved carols, this cantata has something for everyone. You are invited to join us at all of these December happenings at St. John's. Invite others with you! Happy Advent and Merry Christmas! In the month of December, four First Communion confirmation class times will be made available for any baptized youth whose parents have discerned that their children are ready to receive the Lord’s Supper for the first time. These dates and times for class are December 3, 2:30-3:30pm; December 3, 5-6pm; December 10, 2:30-3:30pm; & December 10, 5-6 pm. All classes will be held in the sanctuary. As St. John’s Church Council has supported and endorsed the practice of baptized members of any age being able to receive communion after mutual conversation and instruction between the child, parent(s), and pastor(s), these confirmation classes are open to children and adults of any age. Attendance is required at only one of the four scheduled class opportunities. Families must RSVP their intent on attending a class no later than noon of the day of the class by calling the church office (402-371-1985). If these times do not work for a family, Pastor Justin will happily schedule a personalized time as scheduling allows. As we review how God loves us and that God feeds us, using stories from the Spark Story Bible, we will follow an hour-long slide show, while students practice and learn how communion is received at St. John’s and other churches. Baptized children of God at St. John's who attend a December confirmation class will be invited to receive First Communion at any one of the three worship services on the weekend of December 13/14. If this weekend does not work for a family, please be in conversation with Pastor Justin or Pastor David to discuss other options. We look forward to celebrating First Communion with the families of those baptized young people who will be taking part in the Lord's Supper for the first time. 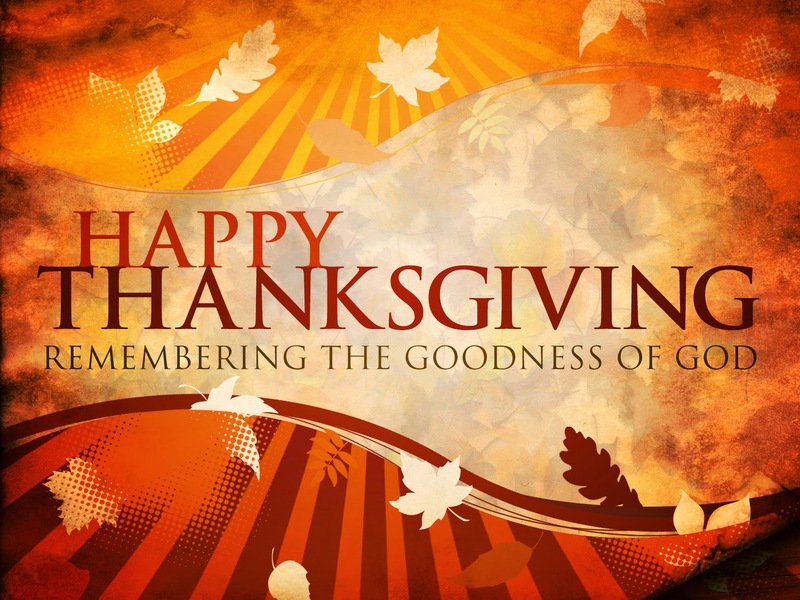 A Thanksgiving Worship Service will be held on Wednesday, November 26, @ 7 PM in the chapel. If you have never participated in the Holden Evening Prayer, it is a beautiful celebration of music and prayers. Please plan on joining us for this evening worship. Reminder: 7th & 8th grade confirmation will be held the first three Wednesdays in November from 5-6 p.m. in the Community Room. Please use the north entrance to arrive and depart confirmation class. On November 5, students will be learning about Abraham & Sarah using a new resource called re:form. New Members will be received and 3rd Grade Bibles will be presented at all worship services the weekend of October 25-26. Worship times are Saturday @ 6 PM and Sunday @ 8:30 & 11 AM. Over the next couple of weeks, St. John's members & staff are creating a Devotional Booklet for November, December, and January. Click here to learn more information and fill out the online form. This Saturday's Blessing of the Animals & Pets is postponed due to predicted weather outside for Saturday October 4, at 11:00am. Too cold for our pet companions outside, let alone our humans! This will be rescheduled. Look for a future announcement with the new date & time. Spots are still available to help out! 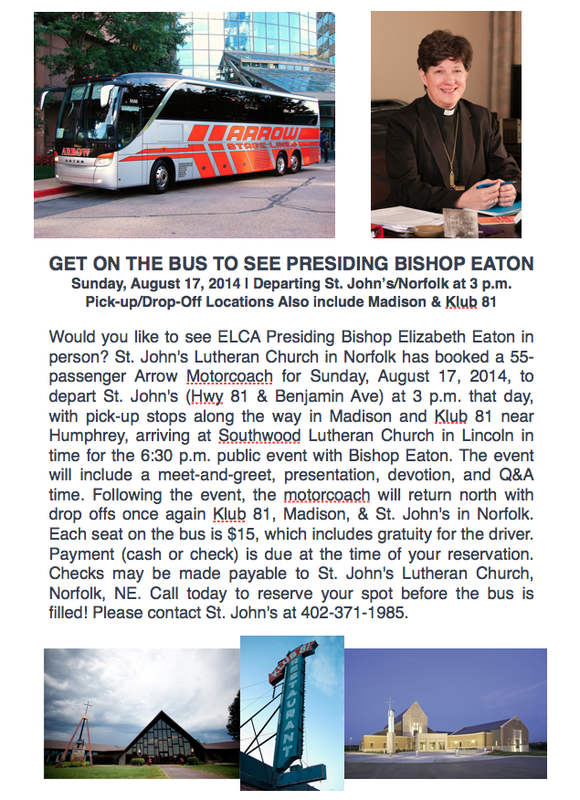 To get signed up or get more information, please contact the church office (402.371.1985) or Karen Widhalm. 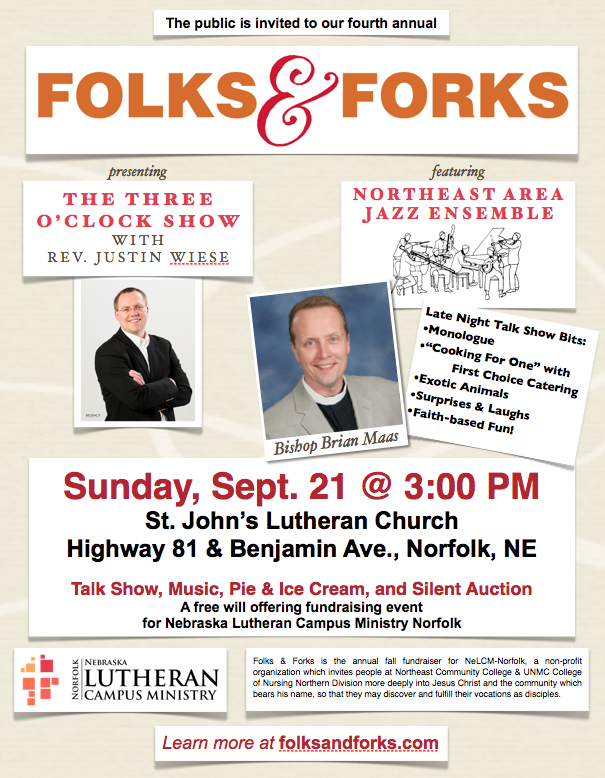 On Sunday, October 5, at 9:45 a.m., join Nebraska Synod Director of Communications & Development Mitch McCartney in St. John's Fellowship Hall during Coffee Hour as he gives a short presentation on Lutheran Disaster Response through the Nebraska Synod, and also is available for a Q&A session with everyone gathered following the presentation. Join us for the Blessing of the Animlas at St. John's Lutheran Church on Saturday, Oct. 4, at 11am. All animals are invited to come for a blessing on the front lawn. 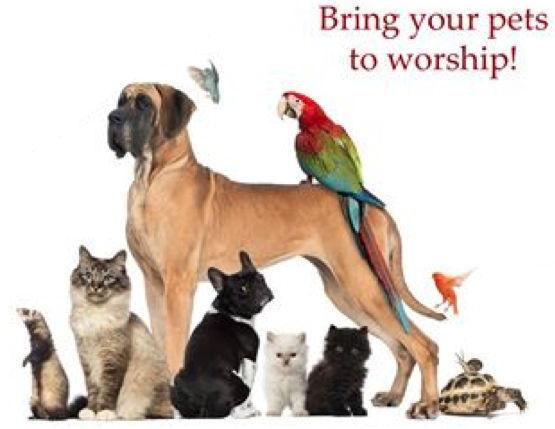 Please bring your owners for a blessing, too! Reminder: all 3rd & 4th graders of St. John's are invited, encouraged, and expected to attend confirmation classes on Wednesdays in October from 2:30 to 3:30 p.m. or from 5 to 6 p.m. in the Community Room on the lower level of the north side of St. John's. Please drop off & pick up students on the north side of the building by the community room door. Any parents/guardians & friends are welcome to attend with the 3rd & 4th graders as we review & learn anew how the Bible is important to us as Lutheran Christians. When (Dates of Class & Time): October 1, 8, 15, and 29 from 2:30-3:30 or 5-6 p.m. 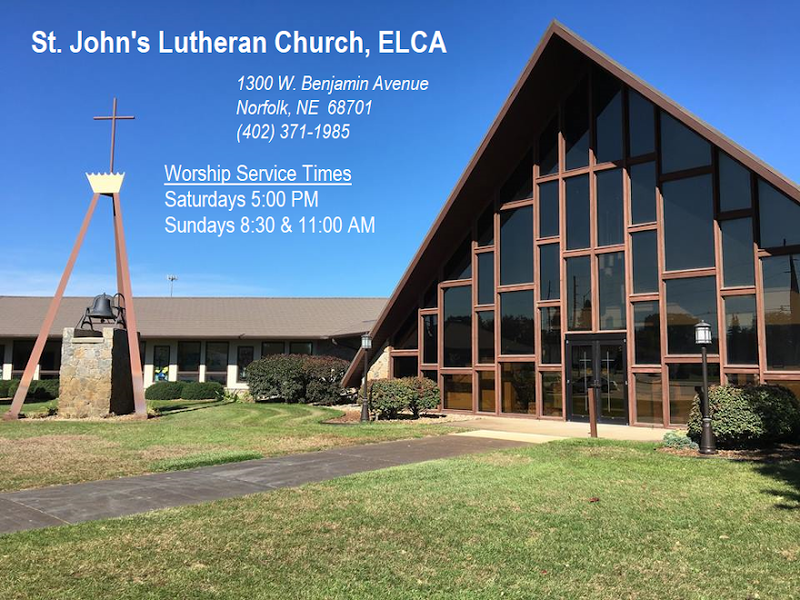 Weekends in September 2014 have been filled with celebration and support of mission and outreach at St. John's Lutheran Church in Norfolk, Nebraska. LIFE OF CHRIST: Class on the Four Gospels, begins Sunday, September 7, 2014, at 9:45am, in the Bethany Room at St. John's Lutheran Church, Hwy 81 & Benjamin Avenue, Norfolk, NE. If you are looking for a class to examine the gospels and seek information on Jesus, this is the course! Pastor David will begin leading this course on Sunday mornings at 9:45am in the Bethany Room. The course is set up to use the “Synopsis of the Four Gospels,” a book that gives the reader a topical study of each story that is written in the gospels. For example: if a particular story about Jesus is found in both Matthew and Luke, the synopsis presents both versions of the story, side by side, so they can be read at the same time and examined. If you would like a copy of this book, please contact the church office. The price (discounted) is $26.00. Pastor David also uses small group discussion and visualization of the Biblical Story in the art of the church to encourage conversations about the texts. The purpose of this course is to help Christians to know Jesus Christ more fully. To know the grace of Christ, the love of Christ, the ways of Christ for our daily lives. That is what we want for ourselves, our family, our friends, and our world around us. By carefully studying the life of Christ, it is our hope that the Spirit of Jesus Christ may come to live in us more fully. The New Communication "Likes & Shares"
Find the registration form here! "Get Fired Up! 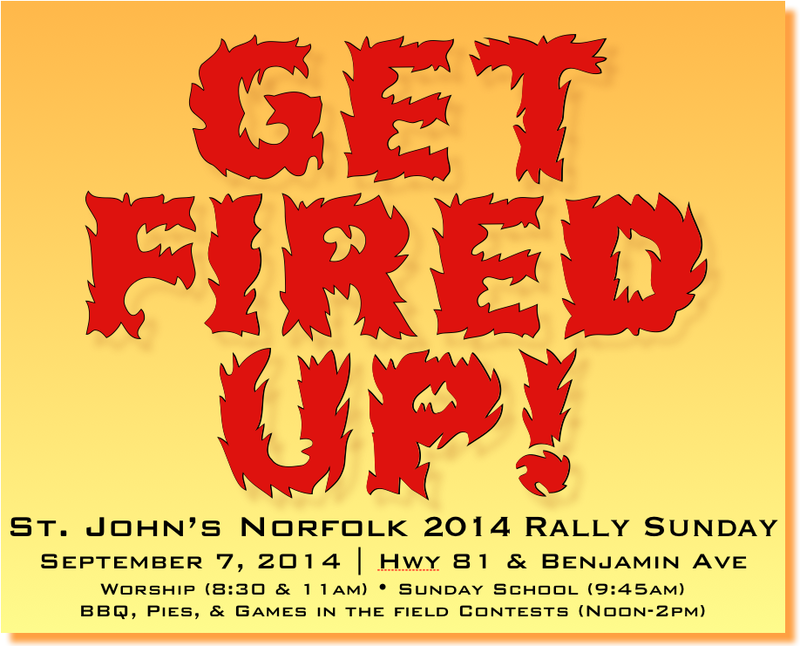 St. John's Norfolk 2014 Rally Sunday" will be held on Sunday, September 7, 2014. Come join us for worship at either 8:30 or 11 AM Sunday School will kick off the year at 9:45 AM, as students & teachers gather in their classrooms for some fun "get to know you" activities. At Noon, come and EAT as BBQ grillers & pie bakers COMPETE for Best BBQ & Best Pie Contests. Around 12:30, Games in the Field for all of our Sunday School Students begin by age group, as Pre-K&K, 1&2, 3&4, and 5&6 compete in Musical Chairs, Bubble Gum Blowing Contest, Water Balloon Toss, Egg On A Spoon Race, and the Classic Foot Race. Bring your family & friends as we get fired up for the fall at St. John's! Dine Out at Applebee's for NeLCM-Norfolk Today! Please print, fill out and return to St. John's via snail mail or in person. Registration forms are also available to pick up in the church office. Hope to see you in August! Click here to check out pictures of St. John's youth attending Summer Camp at Carol Joy Holling Center this summer! 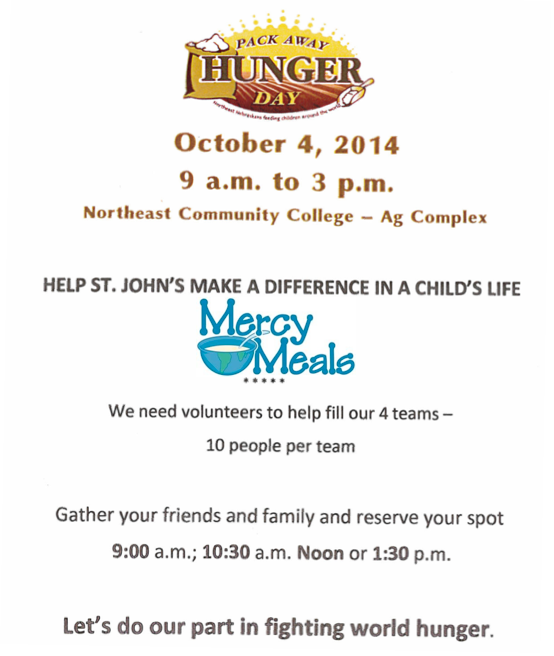 There are so many things scheduled for St. John's and the community this weekend! For all services this weekend, folks are reminded to wear red in celebration of the birthday of the church, Pentecost. First Communions will also be celebrated at each of the weekend services for those who have completed the First Communion Class. On Sunday following the Special Congregational Meeting @ 9:40 am, cake and coffee will be served in the lower level Community Room. This is an opportunity to see the culmination of many many hours of work done by a terrific crew of volunteers. Also this weekend -- on Saturday, Christian Cross Festival events will be happening at Skyview Lake beginning @ 3 PM. Bands, food, child-friendly events all happening until 10 PM when the fireworks begin! And on Sunday, The Bark-B-Q will take place on the front lawn of St. John's! Dress casual, bring your cat or dog and join us as we help raise money for the Animal Shelter of NE Nebraska. Sunday, June 8, St.John's will celebrate Pentecost. Be sure to wear your red and join us for a birthday party for the church, complete with cake and balloons! At any of the worship services, youth who have completed a First Communion class will be celebrating first communion with their family. At 9:40 am there will be a Special Congregational Meeting to vote for extra monies received from Benefaction Board for additional expenditures in the lower level. At the completion of the meeting, we will be moving downstairs to the Community Room for cake and coffee! A Special Congregational Meeting has been schedule for Sunday, June 8, between services (9:45 AM) in the sanctuary. The congregation will assemble "to vote to approve the action of the Benefaction Board approving an additional dispersal of $8,816 in improvements for the Community Room." Immediately following the meeting, everyone is invited to the lower level Community Room for coffee. May 19, 20, or 21 -- First Communion Class (for 5th graders and younger). Attend one class from the 3 choices offered @ 5:15pm. Students will take first communion at any one of 3 services June 7-8. May 25 -- The 11 am Worship Service will move to 10:15 am for the summer. May 26 -- Memorial Day. St. John's Office will be closed in recognition of the holiday. July (date to be determined) for St. John's Garage Sale to benefit Bright Horizons. 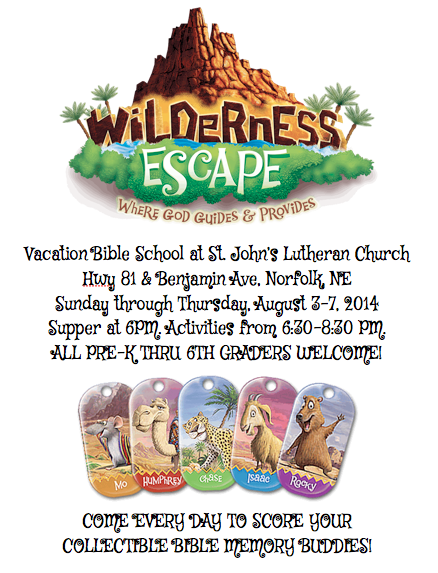 August 3-7 -- Vacation Bible School -- "Wilderness Escape"
as they present “The Passion” at the 11 AM worship service. This very moving pantomime and musical is a depiction of Christ’s crucifixion. Please join us for this unique presentation! The Christian Cross Festival will be holding the first annual CCF Craft Fair (and Bake Sale) on Saturday, March 29 from 10am - 4pm at St. John's Lutheran church in Norfolk. Funds raised will support the 10th Annual Christian Cross Festival scheduled for June 7. If you would like to donate to the bake sale, please bring your baked items to the church during the sale. Questions? Contact Melody Hulse at 402-380-4910. Thrivent members with insurance products need to designate the recipient of Choice Dollars by Monday, March 31. If you don't, Thrivent makes the decision for you. This includes any dollars from 2013, so the amount can be substantial. If you previously had St. John's or some other charity as your designated recipient, you must restate that intent. Go to thrivent.com/thriventchoice or call Thrivent at 1-800-847-4836. You can also call your Thrivent representative here in Norfolk. 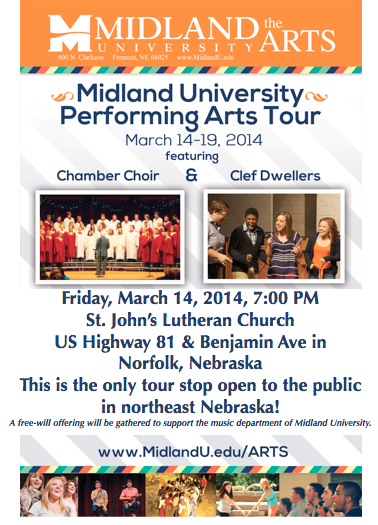 Don't forget to circle Friday, March 14, on your calendar -- Midland University will be in concert @ St. John's! The Midland Chamber Choir & Clef Dwellers will present their free concert @ 7 pm (free-will offering is encouraged for Midland music programs). Thank you to all who are providing over-night lodging and breakfast for choir members. Join us Wednesday, March 12, as we continue our journey through Lent. Dinner will be served by the Women of the ELCA @ 5:30 pm in the Fellowship Hall -- Spaghetti Pie is on the menu, followed by worship @ 7 pm. God’s Giggle Gang is comprised of Christians from a variety of denominations. The purpose of “GGG” is to spread the word of God in a different method as well as spreading joy in the world. During the Lenten season “The Passion” is presented to groups and churches in a serious and reverent method, unlike the type of clowning that is done throughout the rest of the year. This very moving pantomime and musical is a depiction of Christ’s crucifixion. Christ is represented by one white face clown. This well loved, often requested presentation is now in its 12th Lenten season. Join us for worship on Sunday, April 6 at the 11 AM service. You won’t want to miss this opportunity! For information about the upcoming "taste of camp" on April 27, click on the link below. Make sure to get your reservations in asap ($5/person saves you a seat on the bus and includes transportation, meal and snacks, and activities). Young and old are encouraged to come and share the fellowship of the day! Ash Wednesday Worship Services (March 5) are at 12 Noon and 7 PM. A Lenten meal of beef stew, relishes and dessert will be provided by the Mission Life Team @ 5:30 PM. The Season of Lent is fast approaching with Ash Wednesday on March 5. Worship services for Ash Wednesday will be at 12 Noon and 7 PM, with a lenten meal provided by the Mission Life Team at 5:30 PM. 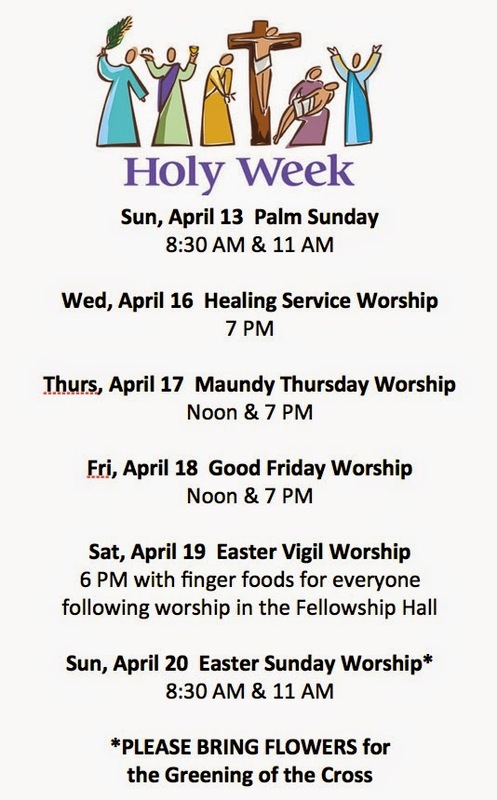 Ash Wednesday, Maundy Thursday and Good Friday will be the only three noon worship services. All other lenten worship services will be at 7 PM only, preceded by a meal at 5:30 PM. This Bible Study will use a combination of materials to study the Week of Jesus Passion as he comes to Jerusalem. The course is a section of Edward F. Markquart’s LIFE OF CHRIST. 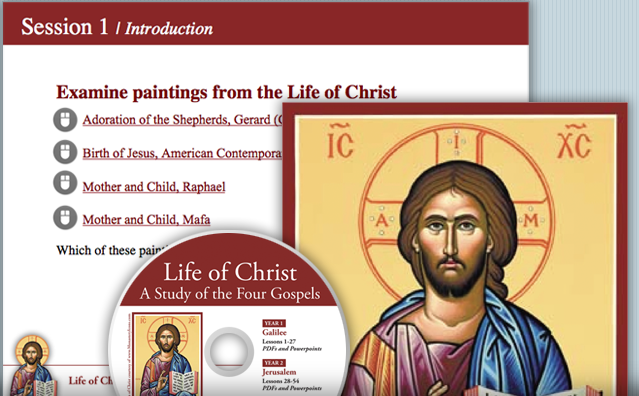 This interactive course uses a book called The Synopsis of the Four Gospels, which gives the student a clear reading of the gospel texts on each topic/subject of study as it appears in each of the Gospels. This allows for a good cross reference on seeing how each Gospel writer described the event in Jesus’ life. Pastor David has advance purchased eight of these books (at a discount, 25.00 each). These books will be used to provide daily Bible readings through the week, preparing for the coming week’s study. An easy to read detailed hand out will be provided to participants, which will follow a Powerpoint presentation including pictures of locations, archeology, maps, and art work inspired from the Bible Text being read. Time for discussion of the texts and pertinent themes are given to the participants. This will be a great study for the Lenten Season! Consider coming and being a part of this conversation with the scriptures! Midland U. Choir coming to St. John's Fri. March 14, 7 p.m.
Are you interested in becoming a member at St. John’s Lutheran? Or, would you like to sit in for a quick refresher of the faith? Starting on Feb. 2, and running through the Sundays of February (9, 16, 23), an Adult Inquiry Class will be held between the services, starting at 9:50 in the Bethany Room. We will talk about Jesus, the Bible, the Grace of God and even Martin Luther. No sign up is needed-but we hope you will put this on your calendar. For those seeking membership, this is our first membership class in 2014. A reminder about upcoming events that St. John's will be holding in January. A Financial Forum will be held Sunday, January 19, at 9:45 a.m. in the Fellowship Hall, to review the proposed 2014 budget and any answer questions anyone might have. On Sunday, January 26, a congregational potluck will be held in the Fellowship Hall at Noon, followed by the annual congregational meeting beginning promptly at 1 p.m.